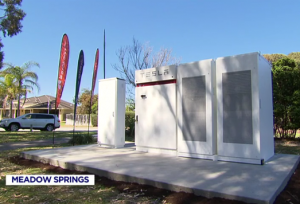 Tesla is just one more unusual mark being stamped onto the Mandurah landscape. Honestly, the most unbelievable things make their way to Mandurah without much fanfare. One, would be the incredibly successful and outstanding, “The Big Picture” program trialling at Halls Head College. Have a look at the videos on their website for a peek at what can happen when children are given the reins to their futures and pursue a passion vs. being shoved through the failing industrial-age, regimented, current system. Then, call your own child’s school and demand Big Picture is implemented. But, I digress. It’s funny how things happen. Tesla has long been a pioneering company, led by their often outrageous and outspoken head, Elon Musk. Regardless of your personal opinion on his antics, no one can really knock him for “not trying” where it comes to batteries, storage, and hoping to help the world through renewable energy supplies. Mandurah’s tiny suburb of Meadow Springs happens to have the lion’s-share of Mandurah’s solar panels, and so they were selected to participate in this trial. Essentially, the participants are paying a dollar a day, thus allowing them to store power generated from their rooftop solar panels during off-times, to use at peak times (drawing up to 8kW during peak evening hours). The whole point is to supply a surplus of renewable energy, aligned with the highest demand times, in order to reduce costs. Roughly 50% of every power bill is spent on setting up new poles and lines. As storage batteries become smaller and more efficient, we can expect more of these to roll out in the upcoming years. Solar has always worked well, but the storage of their absorbed power was the “missing link”. Not any more! Centrally located Tesla batteries could eventually replace the need for poles and wires. The scheme will go into effect in the new year. Wow!